In 1300 a royal grant was made giving the lord of Sutton manor permission to hold a weekly market and annual fair. The building of Holy Trinity Church dates from this time. The church has been altered and extended a number of times since it was first built. The tower was built in the 15th century and the chapels, extended nave, aisles and porch were added c1533 by Bishop Vesey. The church's own website is at - http://www.htsc.org.uk/. See also A Church near You - http://www.achurchnearyou.com/sutton-coldfield-holy-trinity/. You might also be interested in - A History of Birmingham Places & Placenames . 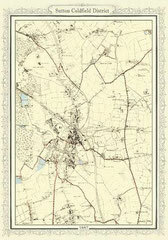 . . from A to Y - Sutton Coldfield - http://billdargue.jimdo.com/placenames-gazetteer-a-to-y/places-s/sutton-coldfield/. Map of Sutton Coldfield 1887 from the Mapseeker website - http://www.mapseeker.co.uk/ - use permitted for non-commercial purposes. The Domesday Book records that, in the time of Edward the Confessor, the manor of Sutton was held by the Anglo-Saxon Earl Edwin of Mercia, and in 1086 was one of many manors owned by King William himself. It was worth four times the value of Birmingham and had extensive meadow and woodland. The manor remained in the hands of the Crown until Henry I exchanged it with Roger, Earl of Warwick for two Rutland manors c1135. Sutton then descended, with short exceptions, with the earldom of Warwick until 1492 when it reverted to the Crown with whom it remained until Sutton became an incorporated borough in 1528. Built by the Earls of Warwick, Sutton Manor House stood on Manor Hill and is first documented in 1315. It was very likely built as a hunting lodge for guests of the earl who had hunting rights over the whole of Sutton Chase. A chapel at the manor house was in existence in 1328, dedicated to St Blaise, the patron saint of woolcombers. The manor house was demolished c1510. However, Bishop Vesey reused the stones of the chapel to build or repair the rectorial tithe barn that stood at the top of the High Street until it was demolished to make way for the railway line through Sutton Park before 1879. Other stones were used construction of Water Orton and Curdworth bridges over the River Tame, this river being the boundary of Sutton Chase. The latter has since been largely rebuilt, but Water Orton's Vesey Bridge is still an important though narrow thoroughfare. Set into the side of the bridge was a carved stone representation of the Archangel Gabriel (now headless) from the manor house chapel. Believed to be part of an Annunciation scene, it was removed in 1926 for safe keeping inside Curdworth Church. After that the erledom of Warwike was attayntyd and cam to the King's hand, the towne of Southton stondynge in a baren soyle fell dayly to decay, and the market was clene forsaken. 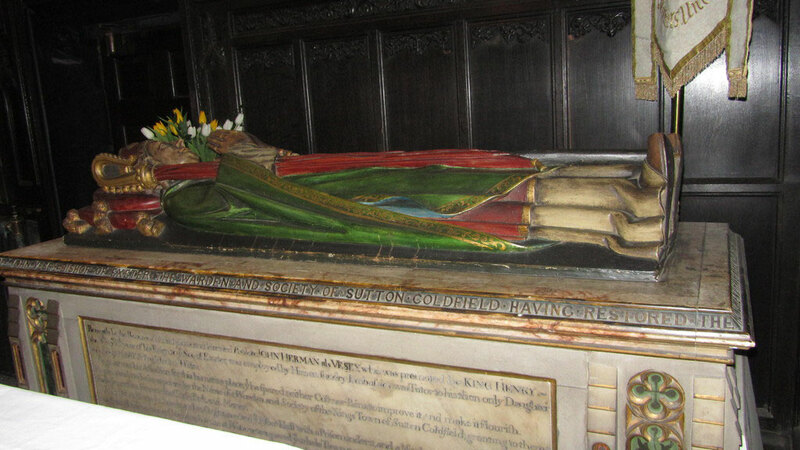 Its restoration was thanks John Harman, Bishop Vesey of Exeter, a close adviser of Henry VIII. On returning to Sutton for his mother's funeral in 1524 he found the town in decline, the market place deserted and the manor house demolished. 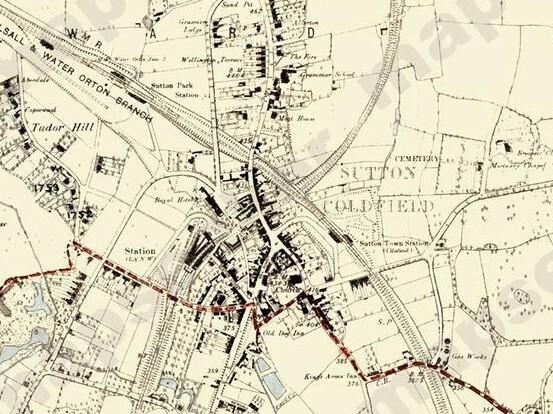 Henry VIII agreed a charter of incorporation for Sutton in 1528, which replaced the lord of the manor by investing the government of the town in a newly-created corporation, the Warden and Society of the Royal Town of Sutton Coldfield. This was, in effect, a self-perpetuating oligarchy made up of prominent local inhabitants. John Harman, alias Veysey, Bisshope of Excestar borne in this towne, much manetynge the decay of it got a new prevelege of Kynge Henry the 8. for restorynge the market there, and began to repayre and build new howses ther, and furtharmore obtayned licence to deforest the chace there; whereupon he buildyd dyvars praty howsys of stone in the forest, and plantyd his pore kynesmen in them, allotynge ground conveniently unto the howsys, for the whiche the tenaunts bere the Kynge a mean rent; besydes this the place where the Erle of Warwiks old howse was, is now convertyd to the use of a fermars howse, and in it dwellythe one of the bisshop's kynesmen. 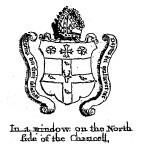 The byshope hathe also instituyd there a gramer-schole and endweyd it with lands. The foundation of Holy Trinity Church on Church Hill may date from the time of the market charter. The first rector, Gregory Harold was appointed in 1305. The church has been altered and extended many times since it was first built. However, the oldest part of the building are the plinths and buttresses in the lower part of the east wall of the chancel which date from the first half of the 13th century. The chancel’s east window of five lights is probably of 15th-century origin, although it has been restored. The church has been altered and extended many times since it was first built. However, probably the oldest surviving part of the building is part of the lower east wall of the chancel where the plinths and buttresses date from the first half of the 13th century. The chancel’s east window of five lights is probably of 15th-century origin, although it has been restored. 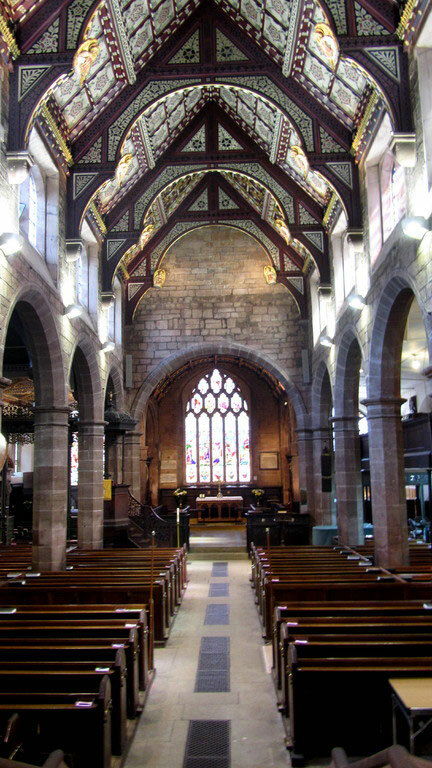 Also old are the nave aisles which date perhaps from the fourteenth century. The south wall is also mediaeval though significantly altered as a result of the repairs after the nave collapsed in 1769. Like many of Birmingham's ancient churches, the sturdy tower was built in the late 15th century and is of three stages with an embattled parapet probably restored in the 16th century; it has original grotesque spouts. Behind the parapet rises a stone eight-sided pyramidal roof. There is evidence that the tower leans a little to the north, as a hollow chase cut in the bottom of the north wall to serve a clock-weight diminishes in depth upwards. The north and south chapels with their round arches, late Perpendicular mouldings, and very late Gothic windows alongside the chancel were added c1533 by Bishop Vesey. The south chapel was built to house the new organ. Also built by Bishop Vesey is the south porch. 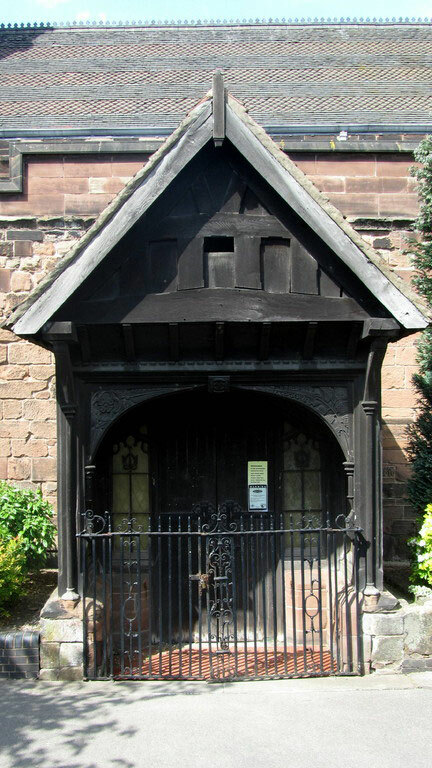 This has early 16th-century timber-framing, but has been since rebuilt though with the retention some original details, including the carving which is a vine pattern to the eastern spandrel and a rose to the western and double-roses on the keyblock. During the 18th century the church was subjected to innovations typical of the time: galleries were built around the church, including family ones for the Ffolliotts of Four Oaks Hall by 1750. In 1758 the Corporation paid £100 for new pews, presumably box pews for rent. But while the work was being undertaken, holes appeared in the floor and much of the nave collapsed. It was found that 'the breach in the Church was occasioned by the Badness of the Foundations of the Arches or Walls of the Middle Isles'. To undertake the repairs and complete the alteration the Corporation employed William Hiorn, a locally well-known architect-builder from Warwick who was working on St Martin’s-in-the-Bull Ring that same year. Problems such as this were not uncommon in old churches at this time. The practice of burial within the church frequently caused subsidence and damage to the foundations and walls. The two arcades also had to be rebuilt with the old material and the roofs were reconstructed at the same time. (They were renewed again in 1863.) The rebuilding gave the opportunity to make more radical neo-classical changes to the church: box pews were constructed throughout, a new pulpit was set up in the chancel, its tester supported on Corinthian columns with a reading desk in front. The focus of the Church of England had moved away from the sacrament of communion to the preaching of the Word. 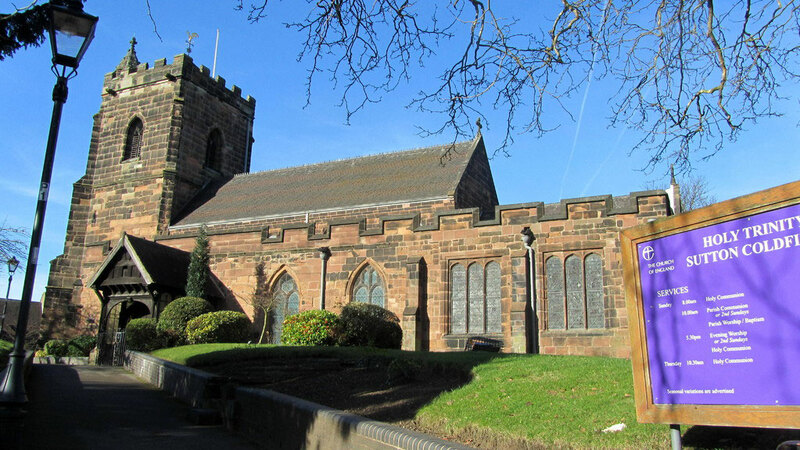 The allocation of the new box pews caused a controversy which continued for some years, the matter being passed to the diocesan court in Lichfield to be settled. The Warden and Society Minutes record that 'several Greedy People of Low Rank' had gone over the heads of the Corporation and applied to the Bishop for the privilege of occupying the best pews. In 1760 new galleries over both the north and south aisles were constructed and a larger two-tier gallery at the west end had been built by blocking in the west arch. The lower part of this gallery was for the Luttrell of Four Oaks Hall, the upper for the choir and a new organ given by the rector, John Riland who was also the town warden. This was a costly operation but was funded by the Warden and Society of Sutton by the sale of timber from Sutton Park. The old stone font was replaced with a white marble basin on a classically-styled pedestal standing near the base of the tower. In 1828 further galleries were built above the side chapels for the children from the newly-opened Town School. The children did not come into church through the main door but through doors specially made in the east wall whose outlines outside are still clearly seen. Girls and infants sat in the north chapel gallery and boys in the south with rush matting on the floor to deaden the noise of their boots. In 1858 the children's galleries were removed and the children on benches in the side chapels. In the third quarter of the 19th century fashions changed again and there were moves to restore the church to its original gothic style. In 1863 all but one of the galleries were removed, the nave roof was rebuilt to a steeper pitch, and the chancel floor was raised. Carved oak panelling was bought from Worcester Cathedral, which was then undergoing restoration by Sir Gilbert Scott, to make the choir stalls and screens. And the pulpit was moved back to its traditional position at the side of the chancel arch. The marble basin of the 18th-century font was placed inside a 12th-century stone font from Over Whitacre, now it is the oldest object in the building and older than the church itself. The font had belonged to Over Whitacre church and was thrown out when that church was rebuilt in neo-classical style in 1766. It was used as a mounting block at the local pub, but was recovered in 1856 and presented to Holy Trinity. At the top are four prominent projecting grotesque heads with straps in their mouths issuing at the sides and meeting each side in pairs of leaves. With the coming of the railway in 1862 the town grew considerably. Further work was carried out from 1874 when a new outer north aisle with a gallery above and vestries were added by H R Yeoville Thomason. 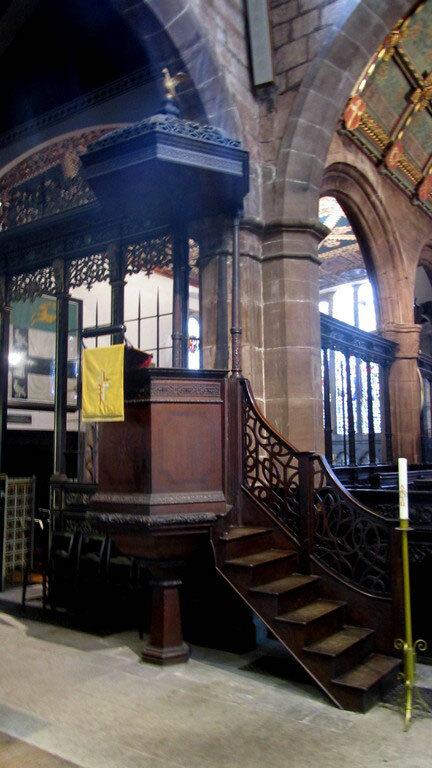 Also in 1875 the pulpit was moved to the north side of the chancel. The tester, which had been removed earlier in the century, was restored to its proper position supported on slender oak columns. About 1939 the pulpit was again moved this time around the pillar towards the Vesey aisle with the steps rising from the nave. The north-west choir vestry was built by W H Bidlake c1900. In 1884 the clock was removed from the tower because it was not functioning well and it was considered that the Town Hall in Mill Street had a clock quite adequate for the whole town. In 1914 the chancel ceiling was decorated following a design drawn up by C E Bateman, who was also responsible for the painting of the nave and Vesey Chapel ceilings in 1929. The stained glass in the church dates from 1863 to 1965. In 1929 the exterior of the building underwent considerable restoration as it did again in 1986. The interior has recently undergone a major reordering. In the north chapel is the altar tomb of Bishop Vesey surmounted with a recumbent effigy. 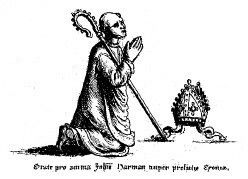 Vesey is depicted wearing a bishop’s mitre and vestments and holding a crosier. The effigy is original but has been renovated and recoloured. It was formerly in a recess protected by an iron railing (now the porch gates) and in 1876 was placed on its present base. 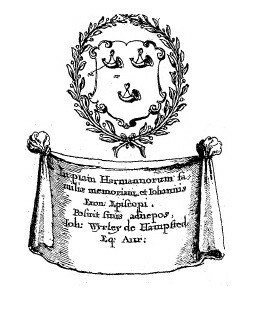 The inscription is 17th-century and describes him as John Harman or Vesey who died in his 103rd year, 1555. 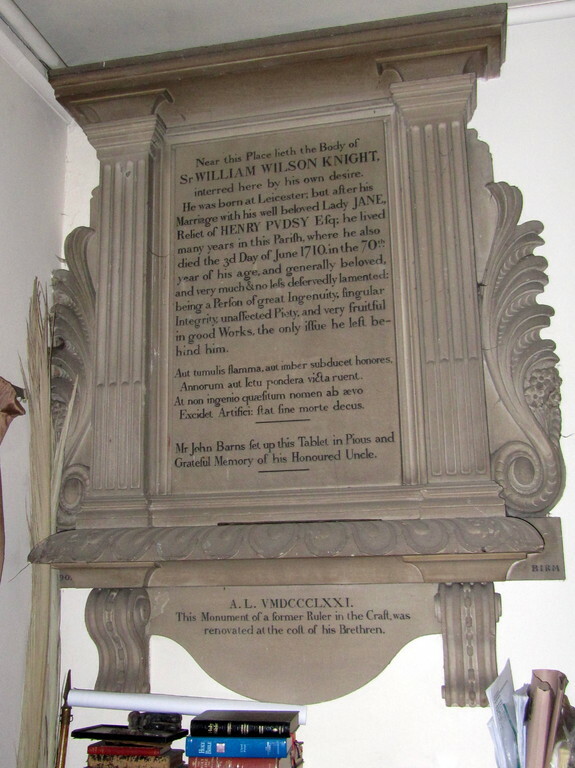 The monument was erected by Sir John Wyrley of Hampstead in memory of his great-uncle. Having fallen into disrepair it was repaired and beautified by the Sutton Corporation in 1748. The inscription records that the bishop 'procured the town to be incorporate by name of Warden and Society of Kings Town of Sutton Coldfield' and that he built '2 isles to the church and an organ, erected a Moot Hall with a prison below, a market place, 51 stone houses, 2 stone bridges, one at Curdworth and one at Water Orton, paved the whole town and endowed a free grammar school'. 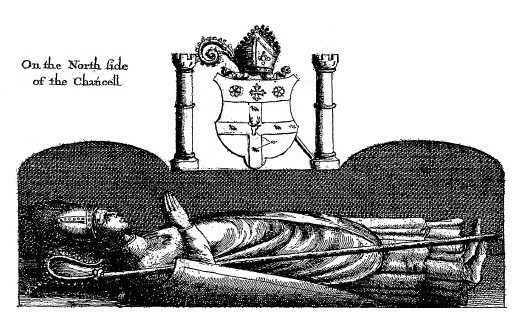 On the wall above the tomb is carved theTudor Royal arms and below it the bishop's own arms. In 1875 Bishop Vesey's monument was again in need of repair. On 25 August of that year the stone over his grave was lifted, revealing part of the skull, a jawbone with a few teeth and other bones. These were put into an jar together with a certificate confirming the facts of the exhumation and the names of the witnesses. The jar was sealed and reburied, covered by the alabaster stone and the present altar tomb was built over it with the Bishop's effigy on top. A large slab in the chapel floor has the indents of brasses of three figures in grave clothes commemorating Hugh Harman alias Veysey d1528 and his two wives. 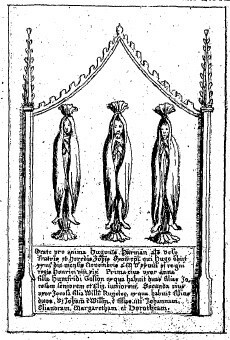 Images below of the Vesey memorials from William Dugdale 1656 Antiquities of Warwickshire. Click to enlarge. On the north wall of the chapel is a brass effigy of Barbara, wife of the Rev Roger Eliot d1606 aged 24. 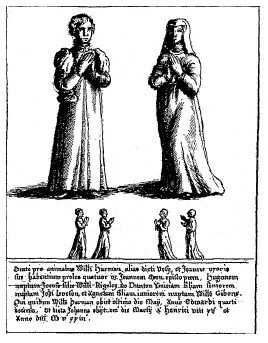 She is dressed in Elizabethan costume with the standing figures of a son and a daughter. Opposite is the brass of Josias Bull d1621 aged 50 also depicted in Elizabethan costume; on separate plates are a shield of arms and figures of four sons and a daughter. A monument commemorates William Jesson of Langley d1725 and his wife Anna d1719; and in the south aisle is an alabaster mural monument to George Sacheverell of New Hall d1715 aged 83. 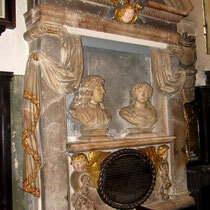 Also against the north wall is a monument to Henry Pudsey d1667 aged 45, the monument being erected by Jane his widow. 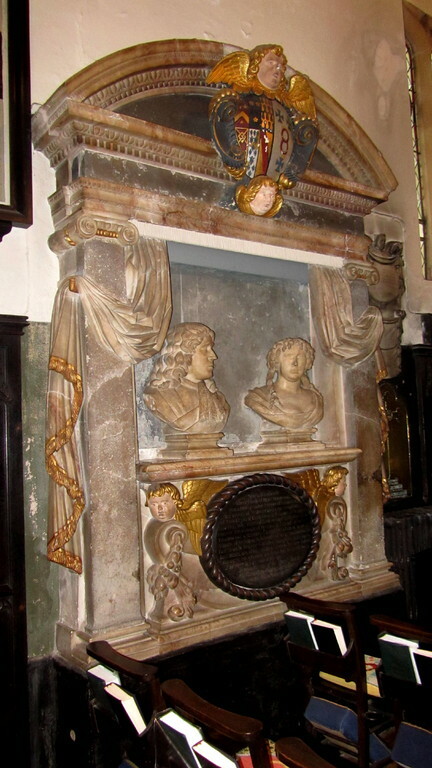 In a draped recess are their busts. 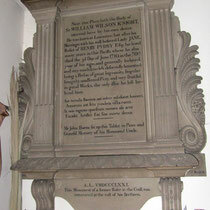 Jane had commissioned a locally-based architect and sculptor, William Wilson to build the monument. During the construction of the piece, the two developed a relationship and were married in 1681. On his death Wilson wanted to be buried alongside his wife inside the church in the Pudsey vault. 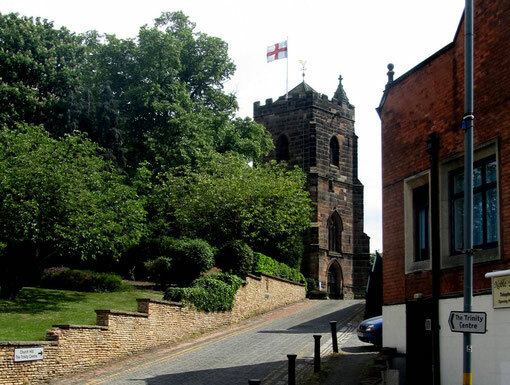 However, Jane’s daughters refused to allow this and, as a result, he bought a plot outside the north wall of the church adjacent to the Pudsey vault and here he was buried in 1710 at the age of 70. In 1858 the clergy vestry was built over his grave so that his grave was now inside the church, albeit on the other side of the wall to his wife. Below: Pudsey and Wilson memorials. Click to enlarge the images. There were certainly five bells in Bishop Vesey's time and probably before. A new ring was hung by Rudhalls in 1784 replaced only ten years later with a six by Thomas Mears of London. Two additional bells by Taylor's of Loughborough were hung in 1884. Only two years later Whitechapel rehung the bells in a strengthened frame. In 1965 the bells and the bell frame were in need of repair, but it was to be 1972 before the bells were refitted and hung in a new frame by Taylor’s. And a very fine ring of bells they are! Acknowledgement - See British History Online - Victoria County History of Warwick Volume 4 Hemlingford Hundred ed. L F Salzman 1947 - http://www.british-history.ac.uk/report.aspx?compid=42686. 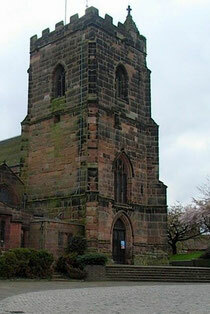 See Church Bells of Warwickshire by Mike Chester - http://www.warksbells.co.uk/. Design statement for construction of a new entrance - http://eplanning.birmingham.gov.uk/Northgate/DocumentExplorer/documentstream/documentstream.aspx?name=public:0901487a80ef3d15.pdf+0901487a80ef3d15&unique=556434&type=eplprod_DC_PLANAPP. Historic England website - https://historicengland.org.uk/listing/the-list/list-entry/1319961. Acknowledgements My thanks to churchwarden Colin for giving me access to the church and for showing me round.